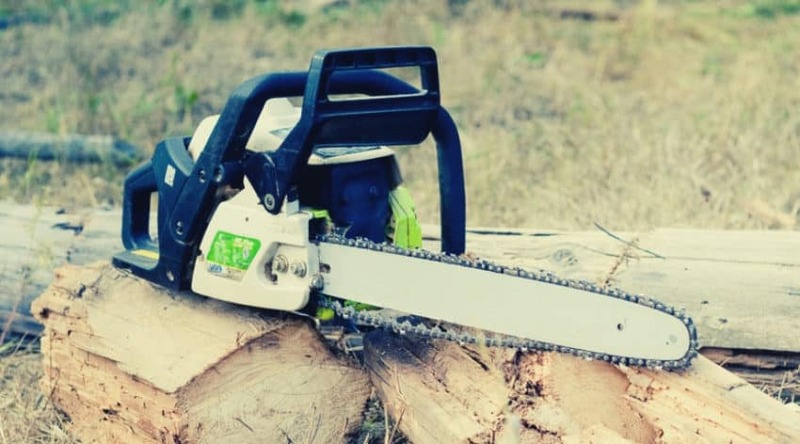 Chainsaws are a powerful tool to have for property maintenance. 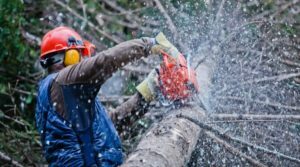 They serve a wide variety of purposes pertaining to cutting and are second to none when it comes to felling trees, bucking logs, trimming branches and limbs, cutting firewood, and in general providing the means to complete any sort of cutting job with relative ease. 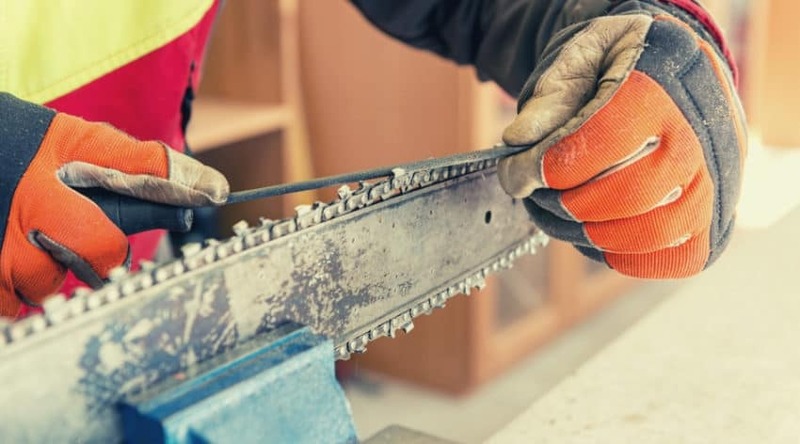 No matter whether you have an electric, or gas powered saw, there are a few details you will need to pay particular attention to concerning general chainsaw maintenance. 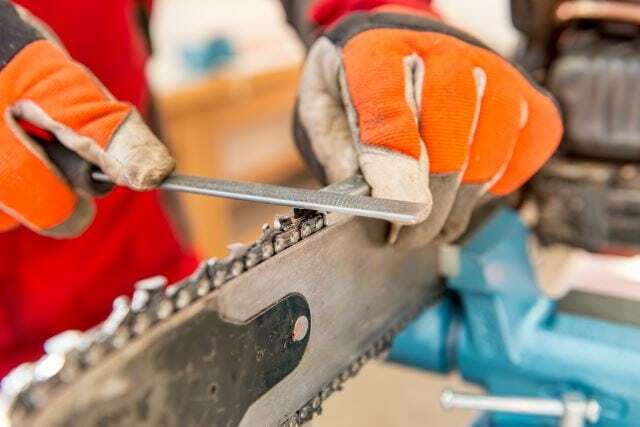 Keeping your saw well maintained will not only ensure it runs well each and every time you use it, the care you take will also help keep it running for a long, productive life. 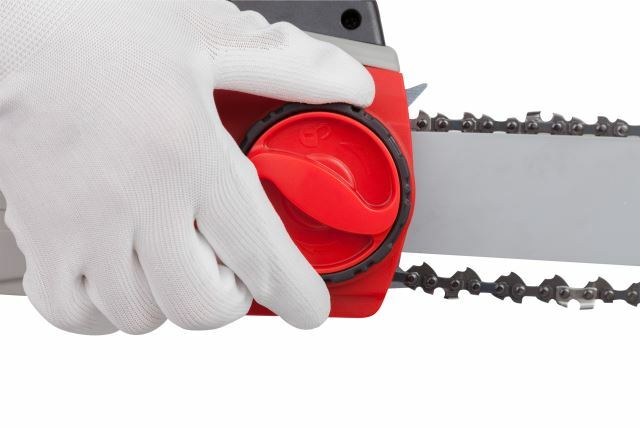 Plus, chainsaw care is part of safe saw usage and helps keep dangerous situations from occurring. 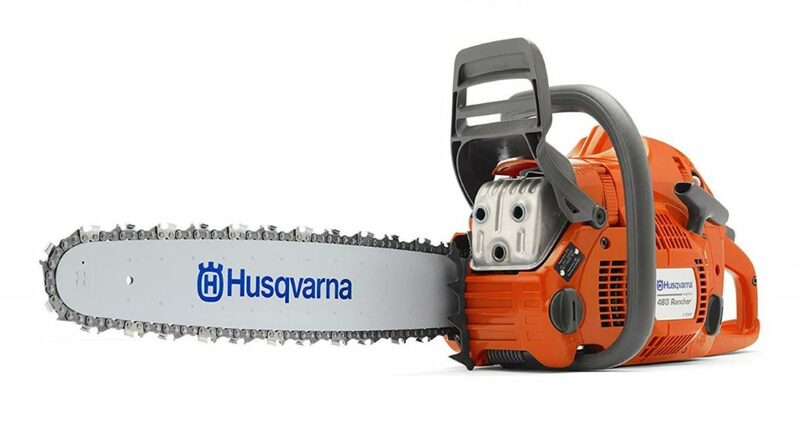 The are many different makes, models, and sizes of chainsaws. Some chainsaws are considered specific for professional use, while others- more for residential, homeowner yard work. But the basic categories saws fit into are fairly straightforward, and help break them down into choices you can more easily consider for the type of work you have. Electric saws are less powerful than gas-powered saws, but should not have their strength underestimated. They are either corded, and run from your 110/120 volt outlet via an extension cord, or are cordless, and work off a rechargeable lithium ion, or NiCad battery type. Both require very little maintenance outside of general cleaning and oiling, chain tension adjustments, and chain sharpening. Gas-powered saws come in a larger variety of choices than their electric counterparts since they are capable of containing larger engines to handle heavier materials. They do tend to be heavier, and louder through, and also require more maintenance- even though it is fairly simple to take care of. Outside of the regular care mentioned above to ensure unfettered cutting, the 2-stroke engine they contain needs specific attention from time to time to keep it operating as it should. 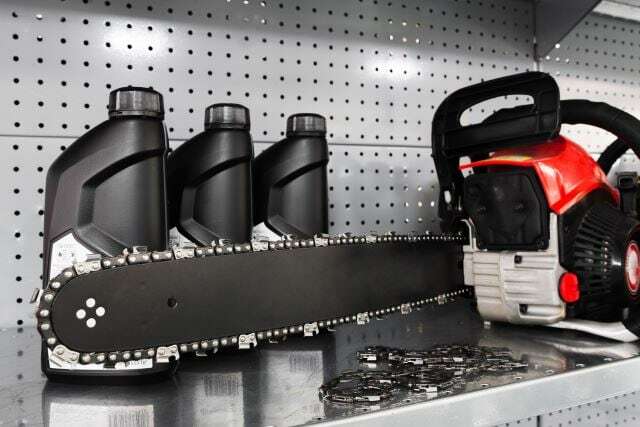 Electric chainsaw maintenance is more specific to keep the saw cutting smoothly, as the engine parts themselves are not accessible, nor require the same attention as a 2-stroke engine does. However, the attention pertaining to an electric saw is the same required for a gas powered saw as cleaning, oiling, and chain care are required on all saws, no matter what the type. When you use a chainsaw, it naturally gets dirty from the types of jobs it is created for. Fine dust, wood chips, leaves, etc are all common to have to clean your bar and chain, as well as the rest of the saw. The bar and chain oil used also creates an adhesive that helps these type of things stick, so wiping down your saw, and between the teeth of your chain after each use is important to avoid clogging of the oil reservoir. Every so often you will want to remove the cover and get all the built-up material from under there as well. Your chain should fit snug upon the bar, but not too snug. Most saws have a tensioning adjustment knob or screw that is easily accessible from outside the cover. You should have a tension on the chain that allows you to pull the chain up approximately a centimeter. If your chain is too loose, you run the risk of it slipping off the bar when in use. This can result in injury, but mostly just ends up creating a bound up mess – especially if you were mid-cut. 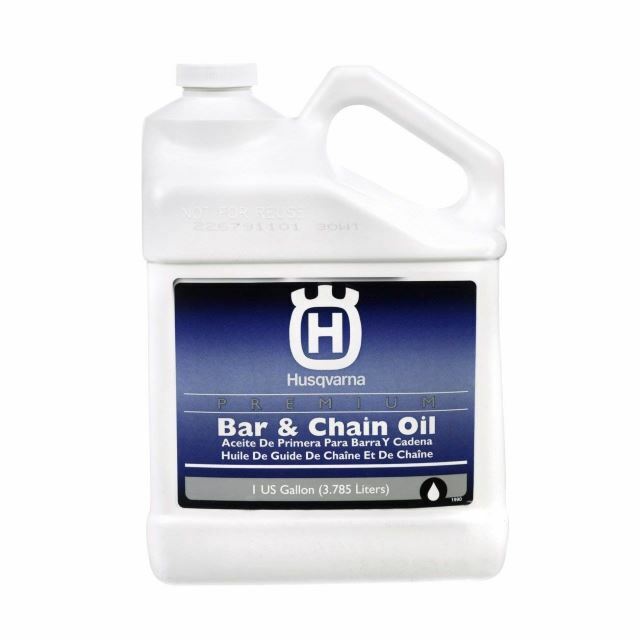 Bar and chain oil is much different than the type of oil used to lubricate the working engine parts of a gas powered saw. This oil is used to keep your chain spinning feeling on the bar, and to help keep it from binding up and burning out. 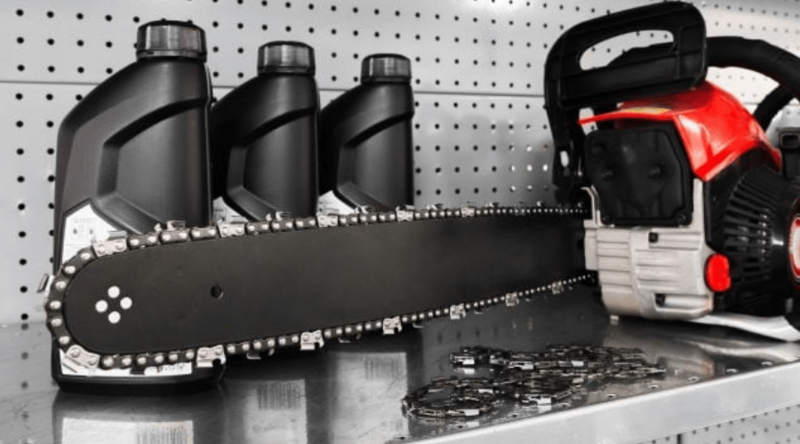 All chainsaws require the use of bar and chain oil, and almost all have a reservoir that allows you to view the levels in order to keep it filled to an acceptable line. To cut efficiently, reduce strain on your engine, and extend you chain life, you will want to keep your chain sharp, and your depth gauges maintained. If you have begun to notice more and more of a fine sawdust rather than wood chips falling from your saw as you work, you are in desperate need of some sharpening. A general rule is to check your sharpness after you have run through about 2 tanks of gas (for a gas saw) or several hours of work. Every third sharpening you may want to also check your depth gauges. These are found between the teeth of your chain, and control the amount of wood cut by the tooth. Over time these will be down until the cutting is inefficient, and care to maintain them will extend your chain life. Most chains have a mark telling you the depth of this and should be closely followed as the chainsaw can become unbalanced or cut improperly if the measurement is not paid attention to. 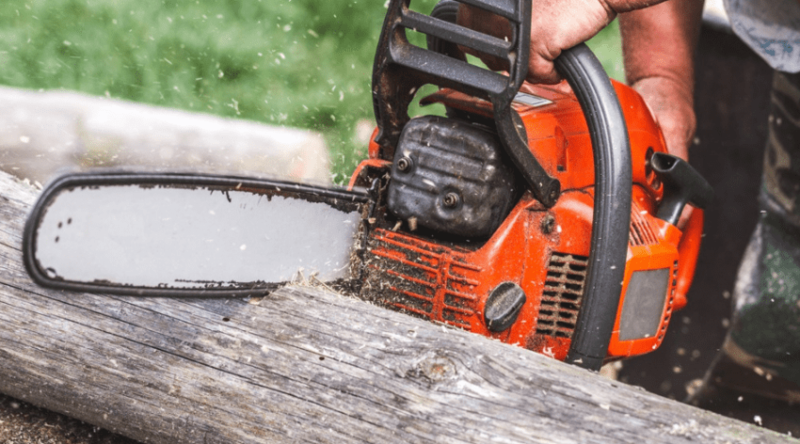 A gas-powered chainsaw requires all of the above maintenance, as well as the additional attention to a 2-stroke engine that is required for proper use. A 2-stroke, or 2-cycle, engine works via the piston movement that creates compression to ignite the fuel to power the motor. This simple design has very basic maintenance that is fairly easy to master and troubleshoot on the occasion you have the need to do so. There are a few basic steps you should always check to maintain the efficient running of your saw. These steps help provide longevity of your engine and keep your saw running at full power. Unlike the above-mentioned steps, they do not have to be checked every few hours or work but should be check periodically, especially if you feel you have lost any power. Each time you fill up with fuel, you need to make sure you mix the correct ratio of oil to gas. Unlike other types of engines, a 2-cycle does not have a separate oil and gas tank, and the lubrication of the engine occurs as the fuel mix moves through it. If you run a 2-cycle without oil, you will ruin the engine with a few minutes. A 50:1 gas to oil ratio is often recommended, but a 40:1 or 30:1 may often be used – be sure to check your ratio on the engine housing, or contact the manufacturer. The air filter can get clogged with dust and oil, and make your engine hard to start, or even run less efficiently. The airbox filter is easy to remove from the mouth of the carburetor, and can be easily rinsed off and scrubbed with a degreaser and toothbrush to make sure it allows for a free flow of air into the engine. When you do this you can also clean down into the carburetor and around it well. The spark plug is what fires your engine up in the first place, and a dirty one, or one with a band gap, may keep your engine from even being able to start. Clean your plug every so often with a wire brush to avoid a carbon buildup, and check your gap distance (usually 0.20” or 0.25”). 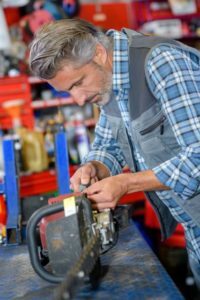 Despite care, they can wear out over time, and so it’s always smart to keep a spare spark plug handy as they are inexpensive and replacing one can get you back to running in no time. Plus, it can help you narrow down where an issue may be once it is replaced. Chainsaws have adjustments screws pertaining to the speed a saw runs at and the idle. Minute adjustments of these screws can help balance the fuel to air ratio to keep the engine from running too rich, or bogging down. Both can be damaging to your saw over time and is extremely inefficient in getting your job done. Generally, you may not have to do this often, or at all, but it is worth keeping in mind if your saw doesn’t seem to be running the way you would like it to. There are a few other things you may want to keep an eye on periodically, or before you put your saw up for the winter. Keeping your saw well maintained is a great way to help ensure you will have a saw that lasts for as long as you need it, and runs the way it is supposed to. Your sprocket is what helps feed your chain around the bar, and it can become nicked and damage with heavy usage. This can cause poor chain rotation, binding, or even kick the chain off the bar. If your sprocket shows uneven wear or damage, replace it not only for better efficiency but also for safety. Chainsaws are air cooled, so if the cooling fins begin to be coated with dirt and grime, it doesn’t take a brain surgeon to figure it will cause the engine to overheat over time. As you work, the fins will get coated with dirt and grime and these should be exposed for a good cleaning at least once a year, or more with heavy usage. Cooling fins are located by the engine case, so you will need to remove some minor parts to get to them. Heavy use will eventually cause the exhaust system to get dirty as well, and once a year or so you may want to access the muffler, exhaust port, and spark screen to clean them off. If you are unsure of where the parts are located, simple diagrams of your specific make and model are easily found online for simple dismantling and easy putting back together. The simplicity of this type of engine and smaller design makes this an easy task. At the bottom of your fuel tank lies a fuel filter. This helps keep any sort of dirt or debris that may have made its way into the fuel tank by accident from running through the system and damaging it. You can easily retrieve the filter from your tank after emptying the fuel out. Either clean the filter or replace it- as it is not an expensive part and you can usually buy a pack of them for less than $10. A recoil starter is a simple design, but over time the cord can become frayed, and dirt and grime can build up within it. Pull the cord out all the way to check for damage and if it binds up you may need to open the starter housing to remove the dirt and lightly oil the parts for easier movement. If the rope is damaged you can replace it, but be sure not to release the spring that provides the tension. Outside of the above-mentioned maintenance for both regular and long-term use, the biggest details to pay attention to for seasonal storage are the cleanliness of the saw, bar and chain oil levels, and the draining of the fuel. Obviously, the steps above provide a guide for keeping the saw clean, but you also want to make sure the bar and chain oil is topped off to avoid any sort of drying from occurring. You may also want to wipe your chain and bar down with some oil to help keep any rust from forming. Siphoning out your gas tank helps ensure you get clean fuel every time you use it. 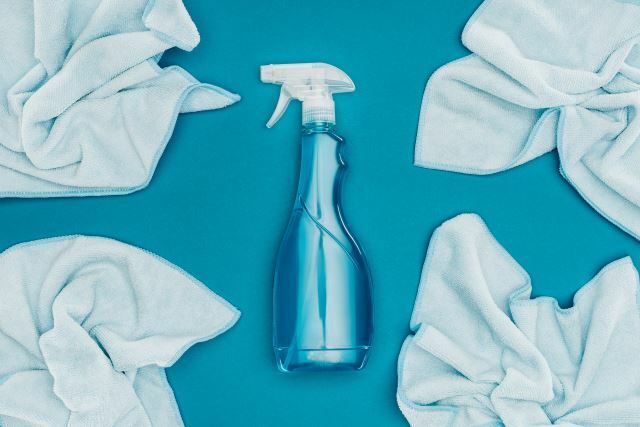 You should always clean the tank of gas if you let it sit for more than 30 days, but especially prior to any season that you know you won’t be using it very often. 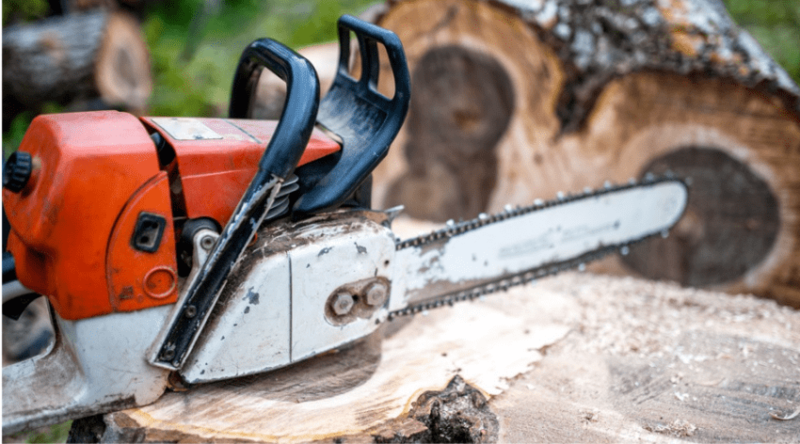 This basic guide should provide you with the direction you need to ensure your chainsaw runs smoothly and efficiently for as long as you have it. Like any other power operated tool, over time it will begin to wear down, but with a regular attention to details, you should be able to use for chainsaw efficiently for as long as it is operable. Let us know below if you have any tips or suggestions, as well as any questions! And, as always, please share!